*Per person. All rates are in CANADIAN DOLLARS. 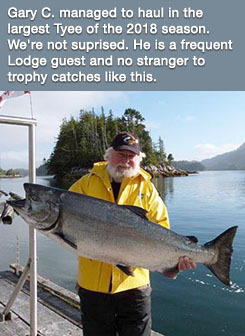 Black Gold Lodge at Rivers Inlet is the premiere sport fishing destination along British Columbia's rugged Pacific coast. 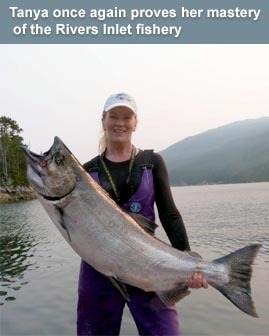 Rivers Inlet is an area known for its enormous chinook salmon—powerful sea-run Tyee—not to mention abundant coho, ling cod, snapper, and barn door halibut weighing over 150 pounds. No wonder trophy hunters from around the world target these waters. All guests stay in comfortable, well-appointed cabins and enjoy great service from our experienced staff. We also offer All-inclusive Trips that feature gourmet meals, boat upgrades, and other premium services. Upgrade boats get you to the prime fishing areas faster and in greater comfort. all-inclusive option that combines restaurant-quality meals with our legendary service.